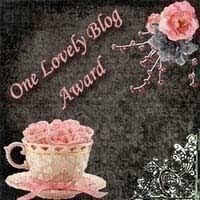 Oh, I love getting blogging awards! Here’s another from fellow writer Aubree. Check out her blog here. Anyhow, today is going to be full of fun. It’s the princess‘ birthday and everyone’s coming over to bbq and jump around in a jumpyhouse smack dab in the middle of a scorching California heatwave. Should be a blast. This entry was posted in blog awards. Congratulations on your lovely award! Won't that look nice on the side of your blog?